On Thursday, March 29, 2018 at noon many Colorado Senior Lobby Board members, along with Huntington Potter, PhD of University of Colorado School of Medicine’s Department of Neurology, other special guests, and Legislators Representative Susan Beckman, Representative Joann Ginal, Senator Jim Smallwood and Senator Nancy Todd gathered at Governor John Hickenlooper’s office in the Capitol to watch the signing of HB18-1091 – Dementia Diseases And Related Disabilities. 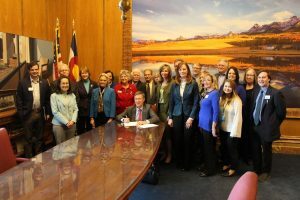 Governor John Hickenlooper signing HB18-1091 on Thursday, March 29, 2018 with many Colorado Senior Lobby Board Members present. 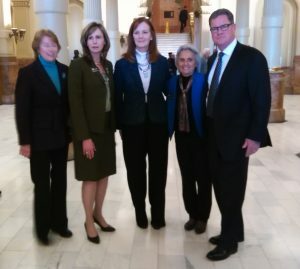 Now here is the story behind HB18-1091 – “Dementia Diseases and Related Disabilities”, and it involves a Colorado Senior Lobby Board Member, Kelley Horton. That is exactly the question that I faced before becoming a CSL member/board member three years ago. Having been involved in the aging industry for over 20 years in Colorado, and a consultant in the dementia industry, I have seen both good and bad with dementia care approaches. The differences in types of dementia are far less subtle than one might think and so the treatments can be quite different. However, existing legislation does not recognize that. And so, for many years, most people (seniors, typically) with dementia have systematically been treated as if they are living with dementia of the Alzheimer’s-type. This is not unlike treating every cancer patient as if they had lung cancer, knowing that the treatment for lung cancer is radically different than for brain cancer or leukemia. HB18-1091 encourages diagnosis and treatment and respect of the individual and their specific form of dementia. I’ve always considered myself an advocate of dementia patient rights – of giving them a voice. This drove me to attend my first CSL meeting in 2015 – I believed I could do something, I just didn’t know what that was … yet. Knowing very little about the legislative process, I began regularly attending CSL’s Monday morning Legislative meetings. These sessions are primarily designed to educate anyone who chooses to attend on the current issues and proposed legislation. A new person always finds the group willing to patiently explain answers to basic questions about how the process works at the capitol and to always ask for and receive clarity around jargon, processes, and, of course, acronyms. Knowledge gained is confidence gained, and soon I was paying close attention to specific pieces of legislation, often following a specific bill to its final conclusion, using what I learned from CSL. In short, the legislative process became demystified. In August of 2016, Ed Shakelford asked me to share some of my knowledge with the CSL group; providing an overview on the main types of dementia. So, I talked about the fact that dementia is much more than memory loss. There are millions of people and their loved ones living with other types of dementia that feel forgotten because they don’t have Alzheimer’s. Also, that when someone is diagnosed with dementia, it should be treated as any other disability where we encourage them to stay connected & thrive within their communities. Building on the confidence in my newfound knowledge about the legislative process, I decided to take the leap and reach out to a couple of our legislators. Early in 2017, while attending CSL’s Senior Day at the Capitol, I approached Representative Joann Ginal, whom I had learned was interested in health-related issues, she graciously gave me her card and an invitation to talk dementia. Quickly Representative Beckman became involved. Result: within two weeks, I had spoken with two legislators about my passion for helping people with dementia. Each came on board and became interested in drafting a new Bill (HB18- 1091) on the subject. This is where my knowledge of dementia issues became important and the three of us, joined by Kip Bishop, VP of CSL, worked through the language in existing statutes, suggesting needed changes. Over time, we all stayed in touch and continued to clarify the Bill with additional information and research. One year from the date I first spoke about dementia to the CSL group, I learned it was time for the Bill to be put forward. Then it was time for discussion, negotiation, and coalition building with interested organizations. Early in 2018, the “Dementia Bill” was posted to the House website. CSL members, following Kelley’s lead, gave their full support. The Bill was assigned its number, HB18-1091, and was heard in the House’s Health, Insurance, & Environment Committee early in February. CSL helped ensure that appropriate testimony was given. Several CSL members testified at the Committee hearing; telling their personal stories. The Bill passed the committee unanimously. By the end of the following week, HB18-1091 was passed by the full House and introduced to the Senate. Once again, CSL assisted in ensuring testimony and support was in place for the assigned committee hearing two weeks later and again it passed unanimously. One-week after that, HB18-1091 passed the full Senate. HB18-1091 was signed by Governor John Hickenlooper on Thursday, March 29, 2018. It shows that one citizen, educated in the legislative process, with a passion for a cause, can actually play a key role in making something happen. We learn from this that the journey is not quick; that there are milestones along the way and that resources and support are critical at each one. CSL educates and informs citizens on the “how” of creating change at the legislature. CSL is all volunteers, citizens with common interests in giving Colorado seniors a stronger voice at the capitol. You too can say: “Something has to change,” and then play an active part in making that change. We’ll show you how. Colorado Senior Lobby, the voice for Colorado Seniors: We educate and inform, raise awareness of senior issues at the capitol, and give voice to Colorado senior issues. We thank Representatives Beckman and Ginal for their work in the originating of this Bill and for their unwavering sponsorship and support, for the sponsorship and support of Senators Smallwood and Todd, and for the unanimous support of the Senate and House. If you have additional questions about HB18-1091 or Dementia, contact Kelley Horton.